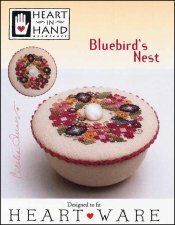 Bluebird's Nest [G8942] - $6.00 : Yarn Tree, Your wholesale source for cross stitch supplies. Cross stitch pattern from Heart In Hand. "Bluebird's Nest," features a floral design with reds, pinks, purples & greens. This design would be perfect for the top of a pincushion or a small bowl! Stitch count 47w x 46h. Stitched on #8220 32 count Belfast Linen Cream.